This article is about the astronomical concept. For precession of the axes outside of astronomy, see Precession. For other types of astronomical precession, see Precession § Astronomy. In astronomy, axial precession is a gravity-induced, slow, and continuous change in the orientation of an astronomical body's rotational axis. In particular, it can refer to the gradual shift in the orientation of Earth's axis of rotation, which, similar to a wobbling top, traces out a pair of cones joined at their apices in a cycle of approximately 26,000 years. The term "precession" typically refers only to this largest part of the motion; other changes in the alignment of Earth's axis—nutation and polar motion—are much smaller in magnitude. Earth's precession was historically called the precession of the equinoxes, because the equinoxes moved westward along the ecliptic relative to the fixed stars, opposite to the yearly motion of the Sun along the ecliptic. This term is still used in non-technical discussions, that is, when detailed mathematics are absent. Historically, the discovery of the precession of the equinoxes is usually attributed in the west to the Hellenistic-era (2nd century BC) astronomer, Hipparchus, although there are claims of its earlier discovery, such as in the Indian text, Vedanga Jyotisha, dating from 700 BC. With improvements in the ability to calculate the gravitational force between and among planets during the first half of the nineteenth century, it was recognized that the ecliptic itself moved slightly, which was named planetary precession, as early as 1863, while the dominant component was named lunisolar precession. Their combination was named general precession, instead of precession of the equinoxes. Lunisolar precession is caused by the gravitational forces of the Moon and Sun on Earth's equatorial bulge, causing Earth's axis to move with respect to inertial space. Planetary precession (an advance) is due to the small angle between the gravitational force of the other planets on Earth and its orbital plane (the ecliptic), causing the plane of the ecliptic to shift slightly relative to inertial space. Lunisolar precession is about 500 times greater than planetary precession. In addition to the Moon and Sun, the other planets also cause a small movement of Earth's axis in inertial space, making the contrast in the terms lunisolar versus planetary misleading, so in 2006 the International Astronomical Union recommended that the dominant component be renamed, the precession of the equator, and the minor component be renamed, precession of the ecliptic, but their combination is still named general precession. Many references to the old terms exist in publications predating the change. Etymologically, "precession" and "procession" are both terms that relate to motion. "Precession" is derived from the Latin praecedere, "to precede, to come before or earlier"), while "procession" is derived from the Latin procedere, "to march forward, to advance"). Generally the term "procession" is used to describe a group of objects moving forward. The stars viewed from Earth are seen to proceed in a procession from east to west daily, due to the Earth’s diurnal motion, and yearly, due to the Earth’s revolution around the Sun. At the same time the stars can be observed to anticipate slightly such motion, at the rate of approximately 50 arc seconds per year, a phenomenon known as the "precession of the equinoxes". In describing this motion astronomers generally have shortened the term to simply "precession". In describing the cause of the motion physicists have also used the term "precession", which has led to some confusion between the observable phenomenon and its cause, which matters because in astronomy, some precessions are real and others are apparent. This issue is further obfuscated by the fact that many astronomers are physicists or astrophysicists. It should be noted that the term "precession" used in astronomy generally describes the observable precession of the equinox (the stars moving retrograde across the sky), whereas the term "precession" as used in physics, generally describes a mechanical process. 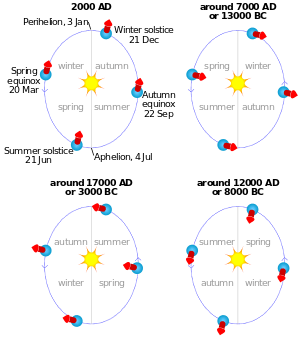 The relationship between the apses, seasons and precession of Earth's axis, as viewed from the north. The seasons indicated pertain to the Northern Hemisphere and are reversed for the Southern Hemisphere. The tilt of Earth's axis and the eccentricity of its orbit are exaggerated. The precession of the Earth's axis has a number of observable effects. First, the positions of the south and north celestial poles appear to move in circles against the space-fixed backdrop of stars, completing one circuit in approximately 26,000 years. Thus, while today the star Polaris lies approximately at the north celestial pole, this will change over time, and other stars will become the "north star". In approximately 3200 years, the star Gamma Cephei in the Cepheus constellation will succeed Polaris for this position. The south celestial pole currently lacks a bright star to mark its position, but over time precession also will cause bright stars to become south stars. As the celestial poles shift, there is a corresponding gradual shift in the apparent orientation of the whole star field, as viewed from a particular position on Earth. For identical reasons, the apparent position of the Sun relative to the backdrop of the stars at some seasonally fixed time slowly regresses a full 360° through all twelve traditional constellations of the zodiac, at the rate of about 50.3 seconds of arc per year, or 1 degree every 71.6 years. At present, the rate of precession corresponds to a period of 25 772 years, but the rate itself varies somewhat with time (see Values below), so one cannot say that in exactly 25 772 years the earth's axis will be back to where it is now. For further details, see Changing pole stars and Polar shift and equinoxes shift, below. Though there is still-controversial evidence that Aristarchus of Samos possessed distinct values for the sidereal and tropical years as early as c. 280 BC, the discovery of precession usually is attributed to Hipparchus (190–120 BC) of Rhodes or Nicaea, a Greek astronomer. According to Ptolemy's Almagest, Hipparchus measured the longitude of Spica and other bright stars. Comparing his measurements with data from his predecessors, Timocharis (320–260 BC) and Aristillus (~280 BC), he concluded that Spica had moved 2° relative to the autumnal equinox. He also compared the lengths of the tropical year (the time it takes the Sun to return to an equinox) and the sidereal year (the time it takes the Sun to return to a fixed star), and found a slight discrepancy. Hipparchus concluded that the equinoxes were moving ("precessing") through the zodiac, and that the rate of precession was not less than 1° in a century, in other words, completing a full cycle in no more than 36000 years. Virtually all of the writings of Hipparchus are lost, including his work on precession. They are mentioned by Ptolemy, who explains precession as the rotation of the celestial sphere around a motionless Earth. It is reasonable to presume that Hipparchus, similarly to Ptolemy, thought of precession in geocentric terms as a motion of the heavens, rather than of the Earth. The first astronomer known to have continued Hipparchus's work on precession is Ptolemy in the second century. Ptolemy measured the longitudes of Regulus, Spica, and other bright stars with a variation of Hipparchus's lunar method that did not require eclipses. Before sunset, he measured the longitudinal arc separating the Moon from the Sun. Then, after sunset, he measured the arc from the Moon to the star. He used Hipparchus's model to calculate the Sun's longitude, and made corrections for the Moon's motion and its parallax (Evans 1998, pp. 251–255). Ptolemy compared his own observations with those made by Hipparchus, Menelaus of Alexandria, Timocharis, and Agrippa. He found that between Hipparchus's time and his own (about 265 years), the stars had moved 2°40', or 1° in 100 years (36" per year; the rate accepted today is about 50" per year or 1° in 72 years). He also confirmed that precession affected all fixed stars, not just those near the ecliptic, and his cycle had the same period of 36,000 years as found by Hipparchus. Instead of proceeding through the entire sequence of the zodiac, the equinoxes "trepidated" back and forth over an arc of 8°. The theory of trepidation is presented by Theon as an alternative to precession. Various assertions have been made that other cultures discovered precession independently of Hipparchus. According to Al-Battani, the Chaldean astronomers had distinguished the tropical and sidereal year so that by approximately 330 BC, they would have been in a position to describe precession, if inaccurately, but such claims generally are regarded as unsupported. There has been speculation that the Mesoamerican Long Count calendar is somehow calibrated against the precession, but this view is not held by professional scholars of Mayan civilization. Milbrath states, however, that "a long cycle 30,000 years involving the Pleiades ... may have been an effort to calculate the precession of the equinox." Similar claims have been made that precession was known in Ancient Egypt during the dynastic era, prior to the time of Hipparchus (Ptolemaic period). However, these claims remain controversial. Some buildings in the Karnak temple complex, for instance, allegedly were oriented toward the point on the horizon where certain stars rose or set at key times of the year. Nonetheless, they kept accurate calendars and if they recorded the date of the temple reconstructions it would be a fairly simple matter to plot the rough precession rate. The Dendera Zodiac, a star-map from the Hathor temple at Dendera from a late (Ptolemaic) age, allegedly records precession of the equinoxes (Tompkins 1971). In any case, if the ancient Egyptians knew of precession, their knowledge is not recorded as such in any of their surviving astronomical texts. Indian astrologers were aware of axial precession since before the Common Era. Although many of the astronomical texts stored in Taxila were burnt during Muslim invasion of India, the classic astronomical text Suryasiddhanta survived and contains references about ayana movements. In a later commentary on Suryasiddhanta around twelfth century, Bhāskara II says: "sampāt revolves negatively 30000 times in a Kalpa of 4320 million years according to Suryasiddhanta, while Munjāla and others say ayana moves forward 199669 in a Kalpa, and one should combine the two, before ascertaining declension, ascensional difference, etc." Lancelot Wilkinson translated the last of these three verses in a too concise manner to convey the full meaning, and skipped the portion combine the two which the modern Hindu commentary has brought to the fore. According to the Hindu commentary, the final value of period of precession should be obtained by combining +199669 revolutions of ayana with −30000 revolutions of sampaat, to get +169669 per Kalpa, i.e. one revolution in 25461 years, which is near the modern value of 25771 years. Moreover, Munjāla's value gives a period of 21636 years for ayana's motion, which is the modern value of precession when anomalistic precession also is taken into account. The latter has a period of 136000 years now, but Bhāskar-II gives its value at 144000 years (30000 in a Kalpa), calling it sampāt. Bhāskar-II did not give any name of the final term after combining the negative sampāt with the positive ayana. The value he gave indicates, however, that by ayana he meant precession on account of the combined influence of orbital and anomalistic precessions, and by sampāt he meant the anomalistic period, but defined it as equinox. His language is a bit confused, which he clarified in his own Vāsanābhāshya commentary Siddhānta Shiromani, by saying that Suryasiddhanta was not available and he was writing on the basis of hearsay. Bhāskar-II did not give his own opinion, he merely cited Suryasiddhanta, Munjāla, and unnamed "others". Extant Suryasiddhanta supports the notion of trepidation within a range of ±27° at the rate of 54" per year according to traditional commentators, but Burgess opined that the original meaning must have been of a cyclical motion, for which he quoted the Suryasiddhanta mentioned by Bhāskar II. Yu Xi (fourth century AD) was the first Chinese astronomer to mention precession. He estimated the rate of precession as 1° in 50 years (Pannekoek 1961, p. 92). In medieval Islamic astronomy, the Zij-i Ilkhani compiled at the Maragheh observatory set the precession of the equinoxes at 51 arc seconds per annum, which is very close to the modern value of 50.2 arc seconds. In the Middle Ages, Islamic and Latin Christian astronomers treated "trepidation" as a motion of the fixed stars to be added to precession. This theory is commonly attributed to the Arab astronomer Thabit ibn Qurra, but the attribution has been contested in modern times. Nicolaus Copernicus published a different account of trepidation in De revolutionibus orbium coelestium (1543). This work makes the first definite reference to precession as the result of a motion of the Earth's axis. Copernicus characterized precession as the third motion of the Earth. Over a century later precession was explained in Isaac Newton's Philosophiae Naturalis Principia Mathematica (1687), to be a consequence of gravitation (Evans 1998, p. 246). Newton's original precession equations did not work, however, and were revised considerably by Jean le Rond d'Alembert and subsequent scientists. Hipparchus gave an account of his discovery in On the Displacement of the Solsticial and Equinoctial Points (described in Almagest III.1 and VII.2). He measured the ecliptic longitude of the star Spica during lunar eclipses and found that it was about 6° west of the autumnal equinox. By comparing his own measurements with those of Timocharis of Alexandria (a contemporary of Euclid, who worked with Aristillus early in the 3rd century BC), he found that Spica's longitude had decreased by about 2° in the meantime (exact years are not mentioned in Almagest). In same chapter VII.2, Ptolemy gives more precise observations of two stars, including Spica and concludes that in each case 2°:40' change occurred during 128 BC and AD 139 (hence, 1° per century or one full cycle in 36000 years, this is the precessional period of Hipparchus as reported by Ptolemy ; cf. page 328 in Toomer's translation of Almagest, 1998 edition)) . He also noticed this motion in other stars. He speculated that only the stars near the zodiac shifted over time. Ptolemy called this his "first hypothesis" (Almagest VII.1), but did not report any later hypothesis Hipparchus might have devised. Hipparchus apparently limited his speculations, because he had only a few older observations, which were not very reliable. Why did Hipparchus need a lunar eclipse to measure the position of a star? The equinoctial points are not marked in the sky, so he needed the Moon as a reference point. Hipparchus already had developed a way to calculate the longitude of the Sun at any moment. A lunar eclipse happens during Full moon, when the Moon is in opposition. At the midpoint of the eclipse, the Moon is precisely 180° from the Sun. Hipparchus is thought to have measured the longitudinal arc separating Spica from the Moon. To this value, he added the calculated longitude of the Sun, plus 180° for the longitude of the Moon. He did the same procedure with Timocharis' data (Evans 1998, p. 251). Observations such as these eclipses, incidentally, are the main source of data about when Hipparchus worked, since other biographical information about him is minimal. The lunar eclipses he observed, for instance, took place on April 21, 146 BC, and March 21, 135 BC (Toomer 1984, p. 135 n. 14). Hipparchus also studied precession in On the Length of the Year. Two kinds of year are relevant to understanding his work. The tropical year is the length of time that the Sun, as viewed from the Earth, takes to return to the same position along the ecliptic (its path among the stars on the celestial sphere). The sidereal year is the length of time that the Sun takes to return to the same position with respect to the stars of the celestial sphere. Precession causes the stars to change their longitude slightly each year, so the sidereal year is longer than the tropical year. Using observations of the equinoxes and solstices, Hipparchus found that the length of the tropical year was 365+1/4−1/300 days, or 365.24667 days (Evans 1998, p. 209). Comparing this with the length of the sidereal year, he calculated that the rate of precession was not less than 1° in a century. From this information, it is possible to calculate that his value for the sidereal year was 365+1/4+1/144 days (Toomer 1978, p. 218). By giving a minimum rate he may have been allowing for errors in observation. To approximate his tropical year Hipparchus created his own lunisolar calendar by modifying those of Meton and Callippus in On Intercalary Months and Days (now lost), as described by Ptolemy in the Almagest III.1 (Toomer 1984, p. 139). The Babylonian calendar used a cycle of 235 lunar months in 19 years since 499 BC (with only three exceptions before 380 BC), but it did not use a specified number of days. The Metonic cycle (432 BC) assigned 6,940 days to these 19 years producing an average year of 365+1/4+1/76 or 365.26316 days. The Callippic cycle (330 BC) dropped one day from four Metonic cycles (76 years) for an average year of 365+1/4 or 365.25 days. Hipparchus dropped one more day from four Callipic cycles (304 years), creating the Hipparchic cycle with an average year of 365+1/4−1/304 or 365.24671 days, which was close to his tropical year of 365+1/4−1/300 or 365.24667 days. We find Hipparchus's mathematical signatures in the Antikythera Mechanism, an ancient astronomical computer of the second century BC. The mechanism is based on a solar year, the Metonic Cycle, which is the period the Moon reappears in the same star in the sky with the same phase (full Moon appears at the same position in the sky approximately in 19 years), the Callipic cycle (which is four Metonic cycles and more accurate), the Saros cycle and the Exeligmos cycles (three Saros cycles for the accurate eclipse prediction). The study of the Antikythera Mechanism proves that the ancients have been using very accurate calendars based on all the aspects of solar and lunar motion in the sky. In fact, the Lunar Mechanism which is part of the Antikythera Mechanism depicts the motion of the Moon and its phase, for a given time, using a train of four gears with a pin and slot device which gives a variable lunar velocity that is very close to the second law of Kepler, i.e. it takes into account the fast motion of the Moon at perigee and slower motion at apogee. This discovery proves that Hipparchus mathematics were much more advanced than Ptolemy describes in his books, as it is evident that he developed a good approximation of Kepler΄s second law. The Mithraic Mysteries, colloquially also known as Mithraism, was a 1st-4th century neo-platonic, mystery cult of the Roman god Mithras. The near-total lack of written descriptions or scripture necessitates a reconstruction of beliefs and practices from the archaeological evidence, such as that found in Mithraic temples (in modern times called mithraea), which were real or artificial "caves" representing the cosmos. Until the 1970s most scholars followed Franz Cumont in identifying Mithras as a continuation of the Persian god Mithra. Cumont's continuity hypothesis, and his concomitant theory that the astrological component was a late and unimportant accretion, is no longer followed. Today, the cult and its beliefs are recognized as a product of (Greco-)Roman thought, with an astrological component even more heavily pronounced than the already very astrology-centric Roman beliefs generally were. The details, however, are debated. As far as axial precession is concerned, one scholar of Mithraism, David Ulansey, has interpreted Mithras as a personification of the force responsible for precession (Ulansey, 1989). He argues that the cult was a religious response to Hipparchus's discovery of precession, which—from the ancient geocentric perspective—amounted to the discovery that the entire cosmos (i.e., the outermost celestial sphere of the fixed stars) was moving in a previously unknown way. His analysis is based on the so-called "tauroctony": the image of Mithras killing a bull that was located in the central place in every Mithraic temple. In the standard tauroctony, Mithras and the bull are accompanied by a dog, a snake, a raven, and a scorpion. According to Ulansey, the tauroctony is a star chart. The bull is Taurus, a constellation of the zodiac. In the astrological age that preceded the time of Hipparchus, the vernal equinox had taken place when the Sun was in the constellation of Taurus, and during that previous epoch the constellations of Canis Minor (The Dog), Hydra (The Snake), Corvus (The Raven), and Scorpius (The Scorpion)—i.e., the constellations that correspond to the animals depicted in the tauroctony—all lay on the celestial equator (the location of which is shifted by the precession) and thus had privileged positions in the sky during that epoch. Mithras himself represents the constellation Perseus, which is located directly above Taurus the Bull: the same location occupied by Mithras in the tauroctony image. Mithras' killing of the Bull, by this reasoning, represented the power possessed by this new god to shift the entire cosmic structure, turning the cosmic sphere so that the location of the spring equinox left the constellation of Taurus (a transition symbolized by the killing of the Bull), and the Dog, Snake, Raven, and Scorpion likewise lost their privileged positions on the celestial equator. The iconography also contains two torch-bearing twins (Cautes and Cautopates) framing the bull-slaying image—one holding a torch pointing up and the other a torch pointing down. These torch-bearers are sometimes depicted with one of them (torch up) holding or associated with a Bull and a tree with leaves, and the other (torch down) holding or associated with a Scorpion and a tree with fruit. Ulansey interprets these torch-bearers as representing the spring equinox (torch up, tree with leaves, Bull) and the autumm equinox (torch down, tree with fruit, Scorpion) in Taurus and Scorpius respectively, which is where the equinoxes were located during the preceding "Age of Taurus" symbolized in the tauroctony as a whole. Thus Ulansey concludes that Mithraic iconography was an "astronomical code" whose secret was the existence of a new cosmic divinity, unknown to those outside the cult, whose fundamental attribute was his ability to shift the structure of the entire cosmos and thereby to control the astrological forces believed at that time to determine human existence, thus giving him the power to grant his devotees success during life and salvation after death (i.e., a safe journey through the planetary spheres and a subsequent immortal existence in the realm of the stars). A consequence of the precession is a changing pole star. Currently Polaris is extremely well suited to mark the position of the north celestial pole, as Polaris is a moderately bright star with a visual magnitude of 2.1 (variable), and it is located about one degree from the pole. The previous pole star was Kochab (Beta Ursae Minoris, β UMi, β Ursae Minoris), the brightest star in the bowl of the "Little Dipper", located 16 degrees from Polaris. It held that role from 1500 BCE to 500 CE. It was not quite as accurate in its day as Polaris is today. Today, Kochab and its neighbor Pherkad are referred to as the "Guardians of the Pole" (meaning Polaris). On the other hand, Thuban in the constellation Draco, which was the pole star in 3000 BC, is much less conspicuous at magnitude 3.67 (one-fifth as bright as Polaris); today it is invisible in light-polluted urban skies. The brilliant Vega in the constellation Lyra is often touted as the best north star (it fulfilled that role around 12,000 BC and will do so again around the year 14,000); however, it never comes closer than 5° to the pole. When Polaris becomes the north star again around 27,800, due to its proper motion it then will be farther away from the pole than it is now, while in 23,600 BC it came closer to the pole. It is more difficult to find the south celestial pole in the sky at this moment, as that area is a particularly bland portion of the sky, and the nominal south pole star is Sigma Octantis, which with magnitude 5.5 is barely visible to the naked eye even under ideal conditions. That will change from the 80th to the 90th centuries, however, when the south celestial pole travels through the False Cross. This situation also is seen on a star map. 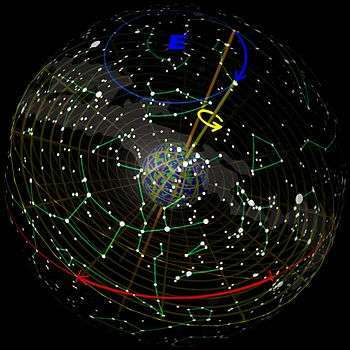 The orientation of the south pole is moving toward the Southern Cross constellation. For the last 2,000 years or so, the Southern Cross has pointed to the south pole. By consequence, the constellation is no longer visible from subtropical northern latitudes, as it was in the time of the ancient Greeks. The 26,000-year cycle of precession as seen from near the Earth. The current north pole star is Polaris (top). In about 8,000 years it will be the bright star Deneb (left), and in about 12,000 years, Vega (left center). The Earth's rotation is not depicted to scale – in this span of time, it should rotate over 9 million times. The images above attempt to explain the relation between the precession of the Earth's axis and the shift in the equinoxes. These images show the position of the Earth's axis on the celestial sphere, a fictitious sphere which places the stars according to their position as seen from Earth, regardless of their actual distance. The first image shows the celestial sphere from the outside, with the constellations in mirror image. The second image shows the perspective of a near-Earth position as seen through a very wide angle lens (from which the apparent distortion arises). The rotation axis of the Earth describes, over a period of 25,700 years, a small circle (blue) among the stars, centered on the ecliptic north pole (the blue E) and with an angular radius of about 23.4°, an angle known as the obliquity of the ecliptic. The direction of precession is opposite to the daily rotation of the Earth on its axis. The orange axis was the Earth's rotation axis 5,000 years ago, when it pointed to the star Thuban. The yellow axis, pointing to Polaris, marks the axis now. The equinoxes occur where the celestial equator intersects the ecliptic (red line), that is, where the Earth's axis is perpendicular to the line connecting the centers of the Sun and Earth. (Note that the term "equinox" here refers to a point on the celestial sphere so defined, rather than the moment in time when the Sun is overhead at the Equator, though the two meanings are related.) When the axis precesses from one orientation to another, the equatorial plane of the Earth (indicated by the circular grid around the equator) moves. The celestial equator is just the Earth's equator projected onto the celestial sphere, so it moves as the Earth's equatorial plane moves, and the intersection with the ecliptic moves with it. The positions of the poles and equator on Earth do not change, only the orientation of the Earth against the fixed stars. 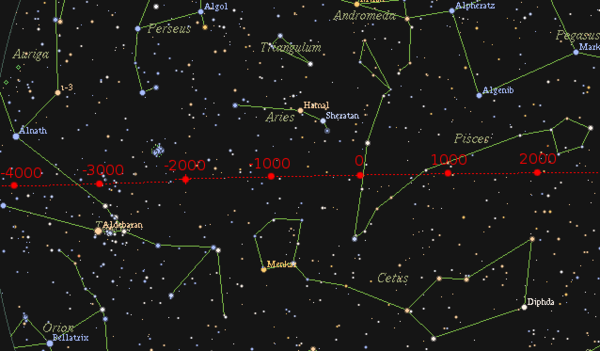 As seen from the orange grid, 5,000 years ago, the vernal equinox was close to the star Aldebaran of Taurus. Now, as seen from the yellow grid, it has shifted (indicated by the red arrow) to somewhere in the constellation of Pisces. Still pictures like these are only first approximations, as they do not take into account the variable speed of the precession, the variable obliquity of the ecliptic, the planetary precession (which is a slow rotation of the ecliptic plane itself, presently around an axis located on the plane, with longitude 174°.8764) and the proper motions of the stars. The precession of the equinoxes is caused by the gravitational forces of the Sun and the Moon, and to a lesser extent other bodies, on the Earth. It was first explained by Sir Isaac Newton. Axial precession is similar to the precession of a spinning top. In both cases, the applied force is due to gravity. For a spinning top, this force tends to be almost parallel to the rotation axis. For the Earth, however, the applied forces of the Sun and the Moon are nearly perpendicular to the axis of rotation. The Earth is not a perfect sphere but an oblate spheroid, with an equatorial diameter about 43 kilometers larger than its polar diameter. Because of the Earth's axial tilt, during most of the year the half of this bulge that is closest to the Sun is off-center, either to the north or to the south, and the far half is off-center on the opposite side. The gravitational pull on the closer half is stronger, since gravity decreases with distance, so this creates a small torque on the Earth as the Sun pulls harder on one side of the Earth than the other. The axis of this torque is roughly perpendicular to the axis of the Earth's rotation so the axis of rotation precesses. If the Earth were a perfect sphere, there would be no precession. This average torque is perpendicular to the direction in which the rotation axis is tilted away from the ecliptic pole, so that it does not change the axial tilt itself. The magnitude of the torque from the Sun (or the Moon) varies with the gravitational object's alignment with the Earth's spin axis and approaches zero when it is orthogonal. Although the above explanation involved the Sun, the same explanation holds true for any object moving around the Earth, along or close to the ecliptic, notably, the Moon. The combined action of the Sun and the Moon is called the lunisolar precession. In addition to the steady progressive motion (resulting in a full circle in about 25,700 years) the Sun and Moon also cause small periodic variations, due to their changing positions. These oscillations, in both precessional speed and axial tilt, are known as the nutation. The most important term has a period of 18.6 years and an amplitude of 9.2″. In addition to lunisolar precession, the actions of the other planets of the Solar System cause the whole ecliptic to rotate slowly around an axis which has an ecliptic longitude of about 174° measured on the instantaneous ecliptic. This so-called planetary precession shift amounts to a rotation of the ecliptic plane of 0.47 seconds of arc per year (more than a hundred times smaller than lunisolar precession). The sum of the two precessions is known as the general precession. α = right ascension of the perturbing body (east from vernal equinox). 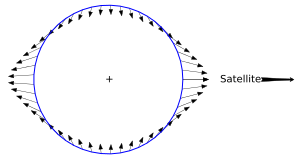 The three unit vectors of the torque at the center of the Earth (top to bottom) are x on a line within the ecliptic plane (the intersection of Earth's equatorial plane with the ecliptic plane) directed toward the vernal equinox, y on a line in the ecliptic plane directed toward the summer solstice (90° east of x), and z on a line directed toward the north pole of the ecliptic. The value of the three sinusoidal terms in the direction of x (sinδ cosδ sinα) for the Sun is a sine squared waveform varying from zero at the equinoxes (0°, 180°) to 0.36495 at the solstices (90°, 270°). The value in the direction of y (sinδ cosδ (−cosα)) for the Sun is a sine wave varying from zero at the four equinoxes and solstices to ±0.19364 (slightly more than half of the sine squared peak) halfway between each equinox and solstice with peaks slightly skewed toward the equinoxes (43.37°(−), 136.63°(+), 223.37°(−), 316.63°(+)). Both solar waveforms have about the same peak-to-peak amplitude and the same period, half of a revolution or half of a year. The value in the direction of z is zero. and 1/2 accounts for the average of the sine squared waveform, accounts for the average distance cubed of the Sun or Moon from Earth over the entire elliptical orbit, and (the angle between the equatorial plane and the ecliptic plane) is the maximum value of δ for the Sun and the average maximum value for the Moon over an entire 18.6 year cycle. where a is the equatorial radius (6378137 m) and c is the polar radius (6356752 m), so e2 = 0.003358481.
dψL/dt = 34.723638"/a vs 34.457698"/a from Williams. The solar equation is a good representation of precession due the Sun because Earth's orbit is close to an ellipse, being only slightly perturbed by the other planets. The lunar equation is not as good a representation of precession due to the Moon because its orbit is greatly distorted by the Sun. in arcseconds, with T, the time in Julian centuries (that is, 36,525 days) since the epoch of 2000.
p = 5,028.796195 + 2.2108696×T + higher order terms. The constant term of this speed (5,028.796195 arcseconds per century in above equation) corresponds to one full precession circle in 25,771.57534 years (one full circle of 360 degrees divided with 5,028.796195 arcseconds per century) although some other sources put the value at 25771.4 years, leaving a small uncertainty. p = a + b sin (2πT/P), where P is the 410-century period. Theoretical models may calculate the proper constants (coefficients) corresponding to the higher powers of T, but since it is impossible for a (finite) polynomial to match a periodic function over all numbers, the error in all such approximations will grow without bound as T increases. In that respect, the International Astronomical Union chose the best-developed available theory. For up to a few centuries in the past and the future, all formulas do not diverge very much. For up to a few thousand years in the past and the future, most agree to some accuracy. For eras farther out, discrepancies become too large – the exact rate and period of precession may not be computed using these polynomials even for a single whole precession period. The precession of Earth's axis is a very slow effect, but at the level of accuracy at which astronomers work, it does need to be taken into account on a daily basis. Note that although the precession and the tilt of Earth's axis (the obliquity of the ecliptic) are calculated from the same theory and thus, are related to each other, the two movements act independently of each other, moving in mutually perpendicular directions. Precession will be greater than p+ by the small amount of +0.135052"/a between +30 Ma and +130 Ma. The jump to this excess over p+ will occur in only 20 Ma beginning now because the secular decrease in precession is beginning to cross a resonance in Earth's orbit caused by the other planets. According to Ward, when, in about 1,500 million years, the distance of the Moon, which is continuously increasing from tidal effects, has increased from the current 60.3 to approximately 66.5 Earth radii, resonances from planetary effects will push precession to 49,000 years at first, and then, when the Moon reaches 68 Earth radii in about 2,000 million years, to 69,000 years. This will be associated with wild swings in the obliquity of the ecliptic as well. Ward, however, used the abnormally large modern value for tidal dissipation. Using the 620-million year average provided by tidal rhythmites of about half the modern value, these resonances will not be reached until about 3,000 and 4,000 million years, respectively. However, due to the gradually increasing luminosity of the Sun, the oceans of the Earth will have vaporized long before that time (about 2,100 million years from now). ↑ Hohenkerk, C.Y., Yallop, B.D., Smith, C.A., & Sinclair, A.T. "Celestial Reference Systems" in Seidelmann, P.K. (ed.) Explanatory Supplement to the Astronomical Almanac. Sausalito: University Science Books. p. 99. ↑ Robert Main, Practical and Spherical Astronomy (Cambridge: 1863) pp.203–4. 1 2 3 4 James G. Williams, "Contributions to the Earth's obliquity rate, precession, and nutation", Astronomical Journal 108 (1994) 711–724, pp.712&716. All equations are from Williams. ↑ Dennis Rawlins, Continued fraction decipherment: the Aristarchan ancestry of Hipparchos' yearlength & precession DIO (1999) 30–42. ↑ Neugebauer, O. "The Alleged Babylonian Discovery of the Precession of the Equinoxes", Journal of the American Oriental Society, Vol. 70, No. 1. (Jan. – Mar., 1950), pp. 1–8. ↑ Milbrath, S. "Just How Precise is Maya Astronomy? ", Institute of Maya Studies newsletter, December 2007. ↑ Translation of the Surya Siddhānta by Pundit Bāpu Deva Sāstri and of the Siddhānta Siromani by the Late Lancelot Wilkinson revised by Pundit Bāpu Deva Sāstri, printed by C B Lewis at Baptist Mission Press, Calcutta, 1861; Siddhānta Shiromani Hindu commentary by Pt Satyadeva Sharmā, Chowkhambā Surbhārati Prakāshan, Varanasi, India. ↑ cf. Suryasiddhanta, commentary by E. Burgess, ch.iii, verses 9-12. ↑ Rufus, W. C. (May 1939). "The Influence of Islamic Astronomy in Europe and the Far East". Popular Astronomy. 47 (5): 233–238 . Bibcode:1939PA.....47..233R. .
↑ van Leeuwen, F. (2007). "HIP 11767". Hipparcos, the New Reduction. Retrieved 2011-03-01. 1 2 3 Benningfield, Damond (14 June 2015). "Kochab". Stardate Magazine. University of Texas McDonald Observatory. Retrieved 14 June 2015. ↑ Kaler, James B. (2002). The ever-changing sky: a guide to the celestial sphere (Reprint). Cambridge University Press. p. 152. ISBN 978-0521499187. ↑ "Basics of Space Flight, Chapter 2". Jet Propulsion Laboratory. Jet Propulsion Laboratory/NASA. 2013-10-29. Retrieved 2015-03-26. ↑ Ivan I. Mueller, Spherical and practical astronomy as applied to geodesy (New York: Frederick Unger, 1969) 59. ↑ G. Boué & J. Laskar, "Precession of a planet with a satellite", Icarus 185 (2006) 312–330, p.329. ↑ George Biddel Airy, Mathematical tracts on the lunar and planetary theories, the figure of the earth, precession and nutation, the calculus of variations, and the undulatory theory of optics (third edititon, 1842) 200. ↑ J.L. Simon et al., "Numerical expressions for precession formulae and mean elements for the Moon and the planets", Astronomy and Astrophyics 282 (1994) 663–683. ↑ Dennis D. McCarthy, IERS Technical Note 13 – IERS Standards (1992) (Postscript, use PS2PDF). ↑ J. Laskar et al., "A long-term numerical solution for the insolation quantities of the Earth Archived May 29, 2008, at the Wayback Machine. ", Astronomy and Astrophysics 428 (2004) 261–285, pp.276 & 278. Berger, A. L. (1976). "Obliquity & precession for the last 5 000 000 years". Astronomy & astrophysics. 51. pp. 127–135. Bibcode:1976A&A....51..127B. Capitaine, N. (2003). "Expressions for IAU 2000 precession quantities". Astronomy & Astrophysics. 412: 567–586. Bibcode:2003A&A...412..567C. doi:10.1051/0004-6361:20031539. Dreyer, J. L. E.. A History of Astronomy from Thales to Kepler. 2nd ed. New York: Dover, 1953. Evans, James. The History and Practice of Ancient Astronomy. New York: Oxford University Press, 1998. Hilton, J.L. (2006). "Report of the International Astronomical Union Division I Working Group on Precession and the Ecliptic" (PDF). Celestial Mechanics and Dynamical Astronomy. 94. pp. 351–367. Bibcode:2006CeMDA..94..351H. doi:10.1007/s10569-006-0001-2. Lieske, J. H.; Lederle, T.; Fricke, W. (1977). "Expressions for the Precession Quantities Based upon the IAU (1976) System of Astronomical Constants". Astron. Astrophys. 58. pp. 1–16. Bibcode:1977A&A....58....1L. Pannekoek, A. A History of Astronomy. New York: Dover, 1961. Parker, Richard A. "Egyptian Astronomy, Astrology, and Calendrical Reckoning." Dictionary of Scientific Biography 15:706–727. Rice, Michael (1997), Egypt's Legacy: The archetypes of Western civilization, 3000–30 BC, London and New York. Simon, J. L. (1994). "Numerical expressions for precession formulae and mean elements for the Moon and the planets". Astronomy & Astrophysics. 282. pp. 663–683. Bibcode:1994A&A...282..663S. Tomkins, Peter. Secrets of the Great Pyramid. With an appendix by Livio Catullo Stecchini. New York: Harper Colophon Books, 1971. Toomer, G. J. "Hipparchus." Dictionary of Scientific Biography. Vol. 15:207–224. New York: Charles Scribner's Sons, 1978. Toomer, G. J. Ptolemy's Almagest. London: Duckworth, 1984. Ulansey, David. The Origins of the Mithraic Mysteries: Cosmology and Salvation in the Ancient World. New York: Oxford University Press, 1989. Vondrak, J.; Capitaine, N.; Wallace, P. (2011). "New precession equations, valid for long time intervals". Astron. Astrophys. 534. p. A22. doi:10.1051/0004-6361/201117274. Ward, W. R. (1982). "Comments on the long-term stability of the earth's obliquity". Icarus. 50. pp. 444–448. Bibcode:1982Icar...50..444W. Wikisource has the text of The New Student's Reference Work article Precession. Bowley, Roger; Merrifield, Michael. "Axial Precession". Sixty Symbols. Brady Haran for the University of Nottingham.